You Can Do It is a straight-shooting video course that will help you find that much needed motivation and focus within yourself to reach for your goals and attain them. The most successful people in the world know how to prioritize and plan their goals. They know how to manage their time so that the most important things are handled first and foremost. Most of us are unable to keep focused and tend to procrastinate. This means you end up killing time. And time is of the utmost value in this world because of how little of it that we have. When you combine lack of time management plus lack of goal setting plus procrastination, you end up with nothing but wasted opportunities and overall a wasted life. Obviously that all depends on what you want out of your life. If you made promises to yourself that one day you would be someone or be something, or you dreamed that you would have your own business or any number of things, then this course is for you. Everything depends on your ability to self manage and motivate yourself. But even some of the most successful people needed that initial nudge to get them going. You’re going to discover how to stop making excuses for yourself, how to set goals, how to create milestones towards your larger goals, how to manage your time like a champ and much more. 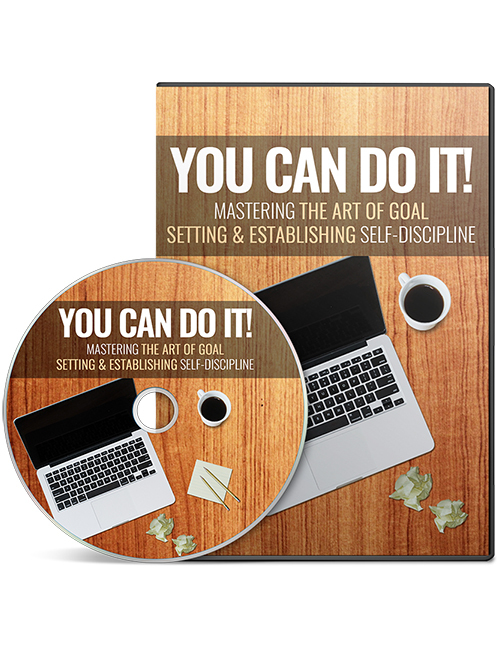 You can also get the You Can Do It Ebook with this video course. Get it all now.